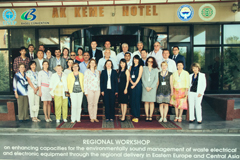 A regional workshop on enhancing capacities for the environmentally sound management of waste electrical and electronic equipment through the regional delivery in Eastern Europe and Central Asia, held from 6 to 8 July 2016 in Bishkek, Kyrgyzstan was organized to raise awareness on the importance of the environmentally sound management of e-waste throughout Eastern Europe and Central Asia. The workshop brought together government representatives from Azerbaijan, Belarus, Moldova, Kazakhstan, Kyrgyzstan, Russian Federation, Tajikistan and Ukraine, industry representatives from Kazakhstan, Kyrgyzstan, and Russian Federation, civil society organizations, Aarhus centres, and international and regional organizations, including UNEP, UNDP, UNIDO and OSCE. Participants exchanged best practices with regard to environmentally sound management of e-waste, including information on new technologies. The workshop revealed specific challenges associated with a lack of specific legislation on e-waste, the application of the principle of extended producer responsibility, and the lack of efficient systems for collection, repair and recycling operations of e-wastes. Finally, the workshop served as a platform to coordinate planned capacity building activities on e-waste in the region by different UN agencies.